Anthony Chamness-1 was born in 1665 in East Smithfield, London, England. He married Ann Pitts. John Chamness, B: 1680 in London, Middlesex, England, D: 1740 in London, Middlesex, England. John Chamness-2(Anthony-1) was born in 1680 in London, Middlesex, England. He died in 1740 in London, Middlesex, England. He married Ann Jones.She was born in 1685 in London, Middlesex, England. She died in 1740 in London, Middlesex, England. Anthony Chamness, B: 05 Feb 1713 in East Smithfield, London, England. Anthony Chamness-3(John-2, Anthony-1) was born on 05 Feb 1713 in East Smithfield, London, England. He married Sarah Cole.She was born on 01 May 1718 in Baltimore County, Maryland, USA. She died in 1773 in Cane Creek, North Carolina, USA. Anthony and Sarah (Cole) Chamness were the founders of the Chamness family in America. Anthony Chamness was born on February 17, 1713 to John and Ann (Weary)Chamness. His family lived in the area of Wapping, now part of London located just southeast of the Royal Mint along the Thames. His parents were married at St. John's Church of Wapping on January 4, 1704. Anthony was baptized at St. John's when he was 18 days old. Smithfield, Wiltshire Lane, and Parrott Alley. The family name is spelled "Chamniss" in the church records. The name had earlier evolved from "Champneys" and "le Chaumpeneys". years. His home is listed as White Chapel in Middlesex County, which lies just east of Wapping. His destination was Maryland. The indenture lists his age as 15, but according to his birth date he was just turning 12. Sarah Cole was born May 1, 1718, probably in Baltimore County, Maryland. She was the daughter of Joseph and Susanna Cole. Joseph died in 1720, leaving land to Sarah in Baltimore County. We do not know how long her mother lived afterward or whether she remarried. Family legend states that Sarah was also an indentured servant, however her grandparents, John and Johanna (Garrett) Cole, owned many tracts of land in Baltimore County and probably helped care for her. 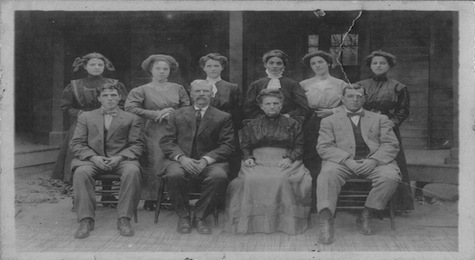 The Cole and Garrett families go back several generations in Baltimore County. In 1732 Anthony would have completed his indenture and become a free man. On November 24, 1735, Anthony and Sarah were married in St. Paul's Parish, Baltimore County, Maryland. Their first 3 children (Elizabeth, Susanna, and Joseph) were born in Baltimore County. On August 26, 1741 they were given a certificate of transfer from the Gunpowder Monthly Meeting in Baltimore County to the Monocacy Meeting located near what is now Buckeyestown in Frederick County, Maryland. So far, this is the first reference to the family found in Quaker records. around the meeting was initially part of Prince George's County, Maryland, but in 1748 it became part of newly formed Frederick County. 1751 it was included in newly formed Orange County. Anthony and Sarah's son John was born in "Orange County" on June 1, 1749, and they were among the initial overseers of Cane Creek Monthly Meeting when it was formed on October 7, 1751. On June 24, 1751 Anthony received a Granville grant of 490 acres lying on Cane Creek. This land is located near the present Cane Creek Friends Meeting west of the village of Snow Camp. It was originally in Orange County, but became part of Chatham County and later Alamance County as these counties were formed. Anthony and Sarah's next 6 children (John, Anthony, Rachel, Ann, Lydia, and Joshua) were born in Orange County between 1749 and 1761. Another child, Stephanus, was born about 1764. He is not listed in the Quaker records or in Anthony's will. at age 23. The oldest daughter, Elizabeth, signed Joseph's marriage certificate in 1763, but died sometime before 1776 when Anthony made out his will. On August 31, 1764 Anthony and Sarah signed papers selling land in Baltimore County which had belonged to her father, Joseph Cole. Sarah died within the next year or two, leaving 6 children at home ages 4 to 16. Anthony Jr. was also dismissed over his marriage. That same year Joseph moved his young family out of the Cane Creek area to New Garden Monthly Meeting (North Carolina). family, including Rachel, age 23. Rachel and Joshua Chamness, age 15, soon married and were dismissed by the Quaker meeting. Anthony died on September 20, 1777. His will is on file in the North Carolina Archives. It bears a reminder of the Revolution going on at the time of his death. It begins "I Anthony Chamness of Chatham County and province of North Carolina.." but the "province" has been crossed out and "State" has been written in above it. Anthony and Sarah are buried in the cemetery at Cane Creek Meeting. Memorandum, That Anthony Chamness of White Chapel in County of MIddlesex did by indenture bearing like date herewith, agree to serve John Cooke of London Vichular or his assigns seven years, in Maryland (his Majesty's Plantation in America) and did thereby declare himself to be of the age of fifteen years, a single person, and no covenant or contracted servant to any other person or persons. And the said master did thereby covenant at his own cost, to send his said servant to the said plantation; and at the like costs to find him all necessary clothes, meat, drink, washing, and lodging, as other servants in such cases are usually provided for, and allowed. "The name "Chamness" was first misspelled, and then corrected, which suggests some cooperation on Anthony's part, (or on his parent's part?). Anthony supposedly signed this with an unusual circular mark, but he was between 12 and 15 years of age, and this was probably the first time he had been asked to do such a thing. This mark is not exactly the same as his mark on his will, but the mark on his will is not a simple "x" either. The mark on his will may represent a capital "C." In any event he came to America, served his term, and became a free American, or at least was close to being one, as he died in 1777. Putting the two stories together ina form that fit each other, we have it this wise: A ship bound for America, was lying at anchor in the pool, with its bow down stream. A man on board the vessel, interested, perhaps inincreasing its cargo and th econsequent profits of the voyage, stole away from the ship and found the boy loitering on the bridge. Entering into conversation with him, the man found the boy interested in the river and the ship and asked him to go with him on board and see the many interesting things on the inside. Not hinking of being carried away from home and kindred, the boy accepted the invitation and was soon on board the ship. The sails were already set for the voyage. The ship swung into the current, passed out through the river and the channel and was soon into the wide ocean. With a heavy heart the boy took a last look at his native land, which he was destined to never see again. The ship anchored in the port of Philadelphia. An now, what should be done with the boy? Tradition says he was sold out until he should come of age to pay his passage. It is not improbable that some good Samaritan Quaker paid his passage, took him into his home and treated him as a member of his family until he was grown to manhood, and then aided him in a futile effort to find his people in London. In those days, kidnapping of children and bringing them to America was not treated as a crime, and members of the Society of Friends were not averse to helping such children by taking them into their families. The voyage just related ocurred in 1726 or 1726 when the boy was about thirteen years old. He came of age in Feb., 1735. Born and partly reared in the city of London, and coming to America in pioneer days, the change was great, and willing or unwilling, he was obliged to endure much of the privations of pioneer life, which consisted larely in clearing away the forests and preparing the soil for cultivation. In those days, emigration was setting strongly southward along the Atlantic provinces. Anthony, the boy, by the time he was of age, or soon thereafter, had drifted into Baltimore Co., MD. Here he found a girl, in the person of Sarah Cole, daughter of Joseph and Susanna Cole. They were of kindred spirit and similar condition in life. She was bound out in a similar manner as he was. They loved each other as only such people can love. She was more than five years his junior, and could not get release to marry until she came of age. He set in and helped her work out her time. Anthony and Sarah were married 11-24-1735 in Baltimore Co., MD. They had nothing at all with which to begin housekeeping. Sarah had found a borken wooden bowl in which she could mix her bread, and Anthony made her a wooden spoon. These two articles were their kitchen equipment. Their kitchen, parlor and bedroom were combined in one room, called a cabin. Outside of this room there were neither chicken, pig, nor cow that they could call their own, but they were very happy in each others love. O, you young Chamness of the 20th century! Would you marry if you had nothing but a broken bowl and a wooden spoon? No, such poverty would be a barrier to your marriage. Anthony and Sarah were young and strong and hardy, and already inured to the hardships of pioneer life. they lived and fared much as others of their generation did. Anthony Chamness, son of John and Ann Chamness, b. in London, on or about 2nd mo. 1713, d. 9-20-1777. Sarah Cole, daughter of Joseph and Susanna Cole, of Baltimore Co., MD now married to Anthony Chamness, b 5-1-1718. For many years in the early history of Cane Creek MM, the name of Anthony Chamness may frequently be found on committees. This shows that he was regarded as a man of integrity and good judgment and worthy to be entrusted with the work of the church. he was industrious and frugal, sociable,, and given to much hospitality. He and his sons worked hard, cleared out a large farm and put it in a good state of cultivation; and Sarah, the good wife and mother, taught her daughters to spin and weave and to many kinds of work now done only in factories. The following is a description of the farm and home of Anthony and Sarah Cahmness as known by one near a century (now almost 2 centuries) ago: "The farm lay a mile west of Cane Creek Friends church, was a good body of land and lay fine. The dwelling was large, perhaps 20 X 80 feet, consisted of two main rooms, made of hewn oak logs, with two shed rooms with porch the whole length on the front side, with a division wall through the center. A small creek ran through the firm, on which there was a grist mill. Large meadows lay on either side of the stream. The barn was commodious, and was occupied by a stationary thrasing machine propelled by horse power, to which many of the neighbors hauled their wheat, to have it thrashed and cleaned." This land is till beautiful today. Of course, the house is no longer standing, only a foundation, but you can feel the presence of these good people. It is really beautiful at Easter. There are old fashioned daffodils (butter 'n eggs) and hawthorne bushes in blom and huge cedar trees." John Chamness, B: 06 Jan 1749 in Guilford County, North Carolina, USA, D: 1825 in Belleville, Illinois, USA. John Chamness-4(Anthony-3, John-2, Anthony-1) was born on 06 Jan 1749 in Guilford County, North Carolina, USA. He died in 1825 in Belleville, Illinois, USA. He married Charity Haworth.She was born on 06 Jan 1749 in Hopewell, Virginia, USA. She died on 27 Jul 1811 in St Clair County, Illinois, USA. Jonathan Parish Chamness, B: 05 Dec 1806 in North Carolina, D: 08 Dec 1875 in Williamson, Illinois. Jonathan Parish Chamness-5(John-4, Anthony-3, John-2, Anthony-1) was born on 05 Dec 1806 in North Carolina. He died on 08 Dec 1875 in Williamson, Illinois. He married Nancy Bright, daughter of Thomas Bright and Lucinda. She was born in 1810 in North Carolina. She died in 1880 in Illinois. James Lemen Chamness, B: 27 Aug 1837 in Illinois, D: 05 Jan 1863, M: Louisa E. Robertson, 24 Jun 1856. James Lemen Chamness-6(Jonathan Parish-5, John-4, Anthony-3, John-2, Anthony-1) was born on 27 Aug 1837 in Illinois. He died on 05 Jan 1863. He married Louisa E. Robertson on 24 Jun 1856, daughter of Joseph A. Robertson and Esther S. Perry. She was born on 09 Jun 1841 in Williamson, Illinois. She died on 08 Mar 1901. Johnathan Parish Chamness-7(James Lemen-6, Jonathan Parish-5, John-4, Anthony-3, John-2, Anthony-1) was born on 02 Nov 1857 in Williamson, Illinois. He died on 20 Nov 1926 in Williamson, Illinois. He married Julia A. Conley on 30 Nov 1876 in Williamson, Illinois, daughter of Hardy S. Conley and Matilda Jones. She was born on 24 Jan 1857. She died on 31 May 1939. Gurtrude Ann Chamness-8(Johnathan Parish-7, James Lemen-6, Jonathan Parish-5, John-4, Anthony-3, John-2, Anthony-1) was born on 18 Oct 1877 in Spillertown, Illinois. She died on 05 Aug 1973 in Marion, Illinois. She married Milton Holloway Simmons on 06 Dec 1904, son of Scott Mansfield Simmons and Emmarillas Maxey. He was born on 14 Aug 1867 in Williamson, Illinois[1, 2]. He died on 05 Feb 1946 in Marion, Illinois.